The Cathedral of Notre-Dame de Paris is one of the most widely visited sites in the French capital. 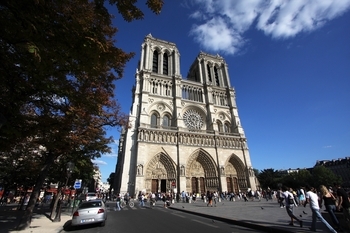 Built on the Île de la Cité, each year Notre-Dame Cathedral welcomes almost 14 million visitors. With its Gothic style, it is famous above all else for its two towers, its gargoyles and its rose windows, which are among the largest in Europe. You can visit the cathedral's interior without reservation and free of charge every day of the year from 8 AM to 6:45 PM (7:15 PM on Saturdays and Sundays). A tourist circuit (payment required) will take you to discover Notre-Dame's Towers (387 steps and no escalator!) where you can see the gargoyles, enjoy the view across Paris and admire the cathedral's largest bell: Le Bourdon. The entrance is outside the cathedral, on the left-hand side of the facade in rue du cloître Notre-Dame. Another visit will take you into the depths of the Archaeological Crypt located under the square in front of the cathedral. This includes the remains of ancient Paris discovered during excavations carried out here in 1965. The entrance is opposite the cathedral's facade, in front of the police headquarters. To be sure of finding a parking in such a busy district, ParkingsdeParis.com recommends that you book your parking place in advance in the Notre-Dame car park on the website. This car park is ideally located under Notre-Dame Cathedral's square and it proposes “Parking City Pass” parking passes for visits to the cathedral. It is on sale exclusively from ParkingsdeParis.com. Don't miss it!